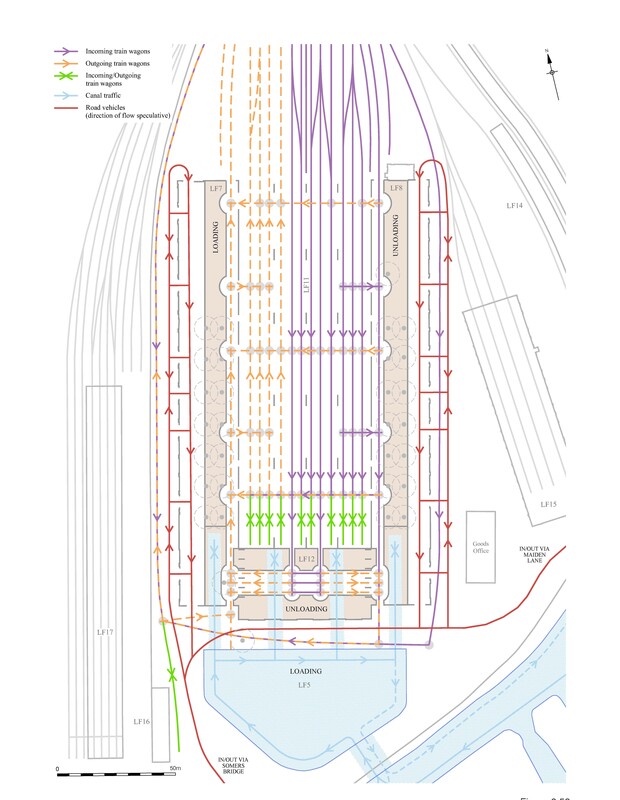 PCA was commissioned to undertake archaeological excavation works and historic building recording at King’s Cross. The work was carried out between 2007 and 2017. The King’s Cross redevelopment comprised a transformation of a 27 hectare area surrounding the former Goods Yard, Regent’s Canal, 19th century railway structures and a former Gas Works, all located to the north of King’s Cross Station. The mixed-use development included the construction of new buildings and the renovation of existing structures. It also involved creating public open spaces, commercial units and buildings forming part of the University of the Arts, London. 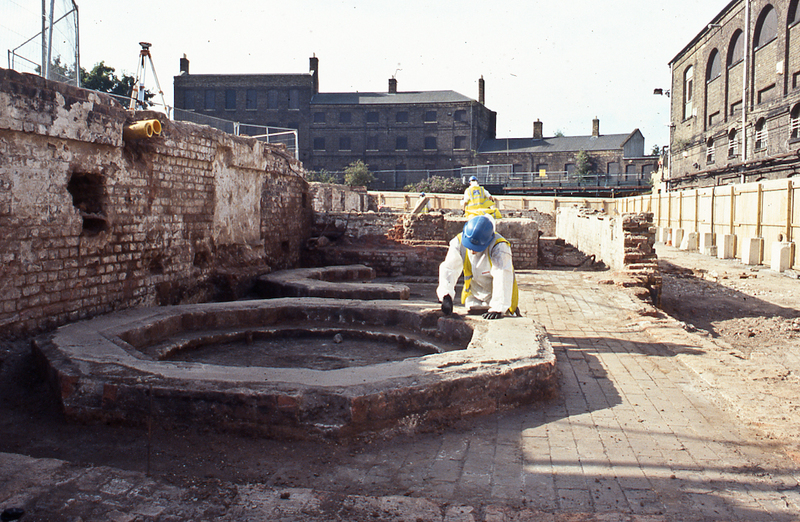 On the Goods Yard project alone, PCA undertook historic archival research, historic building recording, 149 watching briefs and 23 archaeological excavations. The Grade II listed Goods Yard buildings were recorded to Level 4 of English Heritage guidelines – the most comprehensive type of building recording. The Goods Yard comprised a well-preserved railway depot, built from 1850 onwards, and used as a goods terminus and interchange hub between rail, canal and road – ideal for the purposes of the Great Northern Railway. To compete with local rivals, the Goods Yard was designed to the highest of standards and built to house a state-of-the-art hydraulic network. The changing needs of a growing London and Empire resulted in continual modifications and upgrades, which helped to facilitate the yard’s survival into the 20th century. Inbound and outbound traffic from and to the midlands and the north included coal, bricks, stone, grain, fish, potatoes and other vegetables. Two World Wars and depression impoverished the various railway companies and led to the eventual demise of the Goods Yard at King’s Cross. The archaeological excavations identified the remains of the hydraulic system which powered the cranes, hoists and turntables of the yard. Stables for the horses used throughout the yard survived beneath the Goods Shed and were recorded by the PCA team. Railway turntables and rails were exposed and excavated, some of which were later restored and reinstated into the hard landscaping. The heavily contaminated former Gas Works in the south of the site was safely excavated and recorded in order to understand how it functioned. A large roundhouse and Top Shed for repairing trains was also excavated and recorded. The archaeological and historical research has revealed much about the site’s industrial heritage. More information can be found within the first monograph of a three-part series, which explores the development of the King’s Cross area. PCA was commissioned to undertake archaeological evaluation ahead of construction of the new flood defences in Strood, Kent. The project comprised a construction of a flood protection wall along the area potentially prone to flooding and a creation of an earthwork behind the wall to raise the ground. 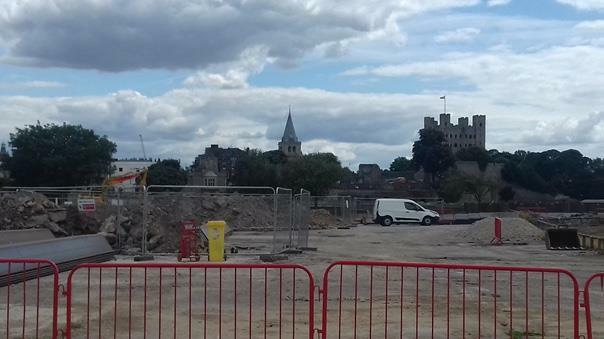 The site is a former location of Medway Council Civic Centre and industrial buildings. The site was located near the bridge linking Strood with Rochester, in the area where Roman and medieval river crossing were known from. The route of Strood’s and Rochester’s High Streets linked by the bridge follows important Roman road and there is evidence for Romano-British buildings and occupation flanking the causeway. Remains of a Roman building was found immediately to the north of the site and there is continued evidence for salt production along the Strood bank of the Medway into the Romano-British period, as well as for burials to either side of the causeway. The medieval bridge was constructed in the 14th century. PCA monitored the geotechnical investigation on the site which proved to be an informative exercise as a ragstone structure was noted, this allowed an early understanding of the potential for archaeological risk on site. The finding suggested a presence of possible Roman or medieval structure which could relate to the one of the bridges. Subsequently the archaeological evaluation, limited mitigation and watching brief were carried out. PCA negotiated with the local authority, designed the scheme of evaluation and conducted the works in 2018. The site proved to have been significantly affected by the 20th century development; however, the south-eastern part of the site contained well preserved archaeological deposits and features. The results showed that the area was densely occupied with several buildings dating from 13th century onwards revealed. No Roman remains were found during the evaluation suggesting that either these are present deep below the medieval deposits or the area is located within artificially made ground on the river foreshore in the post-Roman period.